There are far too many published works to count just on the buses that have served London from the 1900's up to and including the present day. These books are indeed exhaustive works, containing not only hundreds of rare old photos, but also, tons of historical data regarding body types, chassis, variations in body styling, routes, garages.......well, you get the picture, I'm sure. As we have discussed here awhile back, the Brits truly have us "Yanks" outbeat by tens of leagues, regarding bus publications (including magazines) and historic bus preservation. What I am getting at here, is that, imagine if there were even HALF as many books published here on New York's buses. A more detailed and comprehensive work on FACCo. is indeed long, long overdue; likewise a book (or books) on the history of MABSTOA, its buses, routes, etc. Also, there could at least be one book on the old NY "indy" companies, such as GREEN LINE, TRIBORO, etc. Think of how many books have been written on New York's subways, elevateds, and streetcars (of which I have many); now, think of New York buses FINALLY getting the long-overdue coverage they have long deserved. In fact, there are several "Noo Yawk" fellows on this board, who, IMHO, indeed have both the thorough knowledge and the steadfast dedication to see much-needed works such as these actually come into reality. I would, personally, also love to see a series of books that concentrated on buses by borough, as well as at least one work dedicated to the bus depots (past and present) that have served the city's buses since the earliest days. You'll not get any argument from me there, specially given what I saw recently at the Transit Museum Store at Grand Central - a book on BoT and NYCTA buses of the Old Look era (both GM's and Macks). With their history, archival photos, and even what route assignments at which depots. Certainly a picture book cries out for MaBSTOA's New Look buses of 1963-77 (either individually or in tandem with NYCTA's 1959-77 set). Especially to clear up which of the initial four depot assignments (besides West Farms, Amsterdam and 132nd Street) they had. None of the GM New Looks of 1963-67 were alike in any way. The 1964-65 group first to have side roll signs near the rear exit. The 1965-66 group first to have a singular window on the left side opposite from the rear exit, and the rear windows built as 4-piece (instead of converted retroactively from the initial 3-piece) - as well as the batwings first to have the abstract 'OA' logo. And of course the 1966-67 A/C batwing lot. You mentioned a book on the last years of FACCo. ; now HERE is a book that is LONG overdue, and one that would FINALLY give due to the Company's New Looks. A detailed work(s) on MABSTOA's fleet and history would indeed fill a gap that has needed to be closed for many years; from what I have learned here on this board, a work on MABSTOA, with plenty of photos and detailed stats on the buses, depots, routes, etc., would be more than welcome by New York bus enthusiasts. AVENUE B & E. BROADWAY, with its vintage MACKS running well into the 70's would likewise make a great candidate on a little photo/history work. It would be very interesting to see works on NYC buses included detailed facts, stats, and photos on both the long-gone, ill-fated GRUMMANS as well as the now-vanishing RTS units. Such a work could be in two volumes. Volume #2 would cover the years from when the last Old Looks were retired and continue on through the years from there. Personally, I would jump at the chance to purchase a work on MABSTOA; it would be great to have an actual "hold-in-your-hand-book-to-read-and-study-when-you are not-on the-'net". So, when are you going to start writing? I DO greatly appreciate your kind words, my friend, but anything I DO know about New York's buses (past and present) either came from several books, or, from the vast storehouse of knowledge shared here with us by such experts in the field as W.B. Fishbowl, MaBstoa 15, traildriver, N4 Jamaica, to name but a few. I agree with your comments on the need for books dedicated to Fifth Avenue Coach, MaBSTOA, etc. Unfortunately, the lack of books gives me more reason to guard and love my New York related issues of Motor Coach Age. 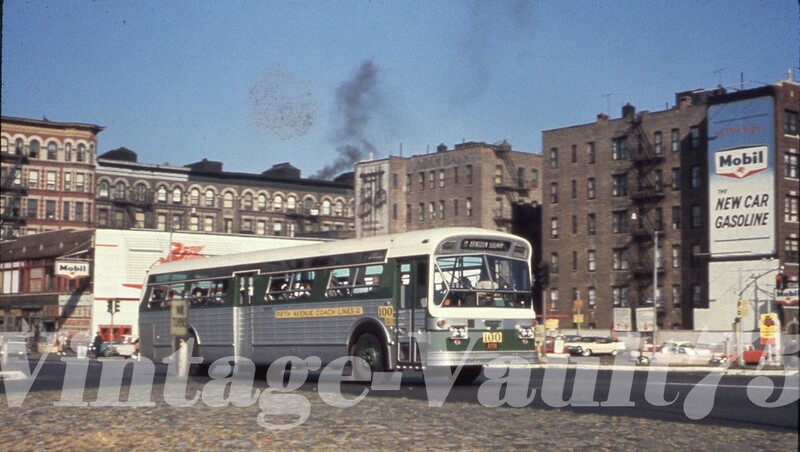 Here is the picture of the lone Fifth Avenue Coach Flxible/Twin Coach demo, number 100 on route 11 to Abingdon Square. Note the company legend and fleet number are mounted on boards just like it was done on the air conditioned GM demo TDH-5106 number 3200. BTW, it is interesting to note that NYCTA's Flxible demo was numbered 200. Still looking for my slide of the number 100 on route 4 to Penn Station. Photo used for educational purposes only! This bus, a demo, was built to Chicago Transit Authority specifications. I believe that it became number 8650 in 1963 in the CTA fleet. Thanks for the clarification; I KNEW I saw the bus under CTA guise; those unusual windows indeed catch the eye! Any idea why the windows were designed/built in this manner? Don't know the reason why, but I do know that they appeared on the first CTA Flxibles and on two demos. Does anyone know in which area in Manhattan this was taken? I'm guessing farther north in its run (maybe above 110th Street)? Was the public so naive in that era to believe that hype?